The 2015 release of Photoshop CC is full of great features for graphic designers and illustrators. 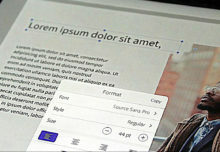 New features include Artboards that allow you to create multiple layouts in one Photoshop document and Linked Assets in Creative Cloud Libraries where when a change is made to an asset, you and your team members have the option of updating it across any Photoshop, Illustrator or lnDesign projects where it’s used! Here I give a rundown of these features and more, all starting from a layout created on a mobile device.